Reginald Morley-Pegge's book The French Horn (Benn, 1960) is one of the finest and most scholarly texts on the history of the instrument, although long out of print. His vast collection of wind instruments is housed in the Bate Collection (www.bate.ox.ac.uk) at the University of Oxford. Reginald Frederick Morley Pegge was born in London in 1890. Morley, the name most used by his friends, was originally a given name that eventually muted into his surname. The family moved to Brighton and Morley-Pegge was sent to school at Summerfields in Oxford and Harrow, where he was a member of the school orchestra. Here he came into contact with Tom Busby and through him W.F.H. Blandford; correspondence with Blandford is a source of much horn lore. France played an important part in Morley-Pegge's life. He was sent there to learn the language, spent a short time as an estate agent in Essex, and then returned to France at age 21 to study at the Paris Conservatoire. He studied horn with Brémond and hand-horn with Vuillermoz, laying the foundation for his tremendous control of the instrument. He was admired for the style and integrity of his performance, although he never had great physical strength or endurance. In 1917, he married Anne Taylor of Paris, and his son was born in 1918. Morley-Pegge served in the British Forces in both World Wars. After World War I, he served with the army of occupation in France until 1919, then with the Reparation Commission until 1925, during which time he had leisure to play the horn and investigate its history. He then worked in the advertising department of Citroen in Paris until he secured posts as a professional musician in 1927. When the Germans invaded in 1940, the family fled to Edinburgh, leaving most possessions, including his instrument collection, behind. His son later returned to the house in France and found the collection mostly intact. From 1927, Morley-Pegge played with the Orchestre Symphonique de Paris, then the Colonne (Paris) Orchestra, Association des Concerts Poulet, and the Paris Radio Orchestra. During world War II, he played for the Reid Orchestra in Edinburgh (while also working in military transport) and later for the Ballet des Champs Élysées and the International Ballet. While in Edinburgh, he developed a friendship with Lyndesay Langwill, and their correspondence is also a trove of lore. At this time, he became a historian of the serpent and of other brass and woodwind instruments in addition to the horn. 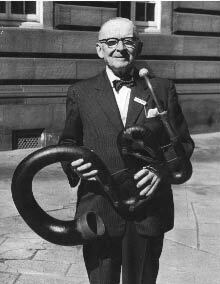 During all this time, Morley-Pegge added to his knowledge of the history and theory of the horn, examining, playing, and photographing every example that came his way. He built up an encyclopedic body of knowledge that was the basis for his authoritative book, articles for Grove, and a vast correspondence. In the 1930s, he was invited to recatalogue the wind instruments in the collection of the Paris Conservatoire, a mark of the esteem in which his scholarship was already held. He also became an accomplished photographer and frequently exhibited at the Paris Salon. He was known as a genial man, a wit, and a connoisseur of wine and food. Morley-Pegge was friends with Philip Bate from 1939, first by correspondence and then in person. Most of his instrument collection and all of his papers went to the Bate Collection at Oxford. Morley-Pegge was a founder and active in the Galpin Society from its inception in 1946. This brought him into a wider musicological circle. He also had many correspondents, including many from the US, and he was meticulous in replying. During most of his playing career, Morley-Pegge was faithful to the French type of horn on which his technique had been formed, although later he used a Kruspe double horn and finally a Berlin Schmidt B-flat horn with an added valve and supplementary slides. This last horn was bought by Harold Meek of the Boston Symphony Orchestra after Morley-Pegge's death (the two had corresponded but never met). Morley-Pegge was elected an IHS Honorary Member in 1971. Tributes appear in the November 1972 issue of The Horn Call and at the Bate Collection website.